Akari is a transgendered woman. Her birth name is Mitarai Toukichirou. Although she is thought less skilled at fighting than the other Shiseiten when she first appears, her magical abilities are on par with the other Shiseiten and she is later revealed to be a superb swordsman. She can manipulate ki, enabling quick healing and unlimited fighting energy, although she cannot use her abilities on herself. She also wields the Devil Eye, an ancient weapon embedded in her gloved left hand, that turns everyone who makes eye contact with it into dust, though Akari hates using it because she feels it is only a tool for murder and has no place in honorable battles. The Devil Eye also serves as a barrier by protecting its bearer from harmful spells. In the fight against Mekira I, the berserker used his Medusa Eyes (a lesser version of the Devil Eye that turns its victims to stone) on Akari, only to fail. Akari then used the Devil Eye on Mekira which turned him to dust. She is often used as comic relief. She uses a shakujou, a staff with bells and rings at the top. Once, she made Kyo promise to marry her if she ever landed a hit on him, but she is unsuccessful in the series. 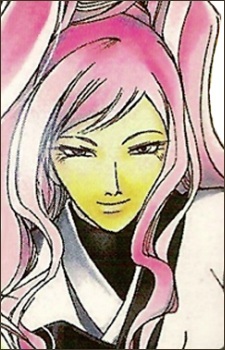 She first appeared in volume 22 of the manga. In that volume, she also revealed her past, where she was raised as a female even though she was born male since traits like hers were often stronger in women. Often she was treated as a demon due to her powers, or people simply got close to her just to use her powers. She was the last to join the Shiseiten. It is revealed later that Hishigi implanted the Devil Eye into Akari's hand as a way of spying on her and to awaken her true powers. When activated, the Devil Eye takes over Akari and transforms her into Ashura. Kyo kills the Devil Eye by showing it a reflection of itself, from which point on Akari is free of control.